Whether you are a cyclists or just sit at your desk all day, you probably have neck and shoulder issues. When we round forward over our tasks, the back muscles become long and weak and the chest muscles short and tense. This gives us the “hunched back” look, and actually restricts the lungs since we are closing off the space around the rib cage. With our head forward we begin to put strain on our upper back and neck. Some gentle stretches will help eliminate this poor posture and allow the lungs to breathe easier. 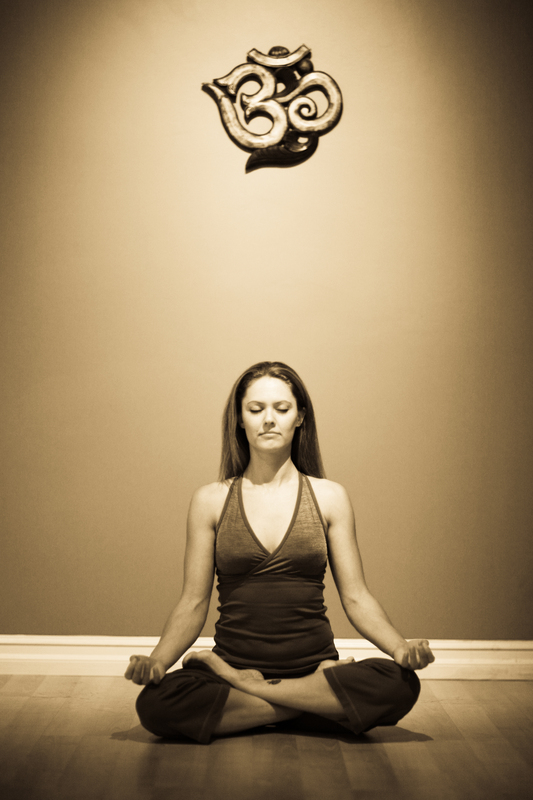 Begin by sitting cross legged or even in a chair, the spine long. Drop your right ear to your shoulder and place your right hand on your left temple. Gently guide the ear closer to the shoulder. After several breaths remove your hand and slowly bring the head back to center. Repeat this on the other side. Making sure the spine is still long, turn to look over your right shoulder. Place your right hand at the back of the head and gently guide the chin closer to the shoulder. You should feel this along the side neck and behind the left shoulder blade. After a few breaths slowly remove the hand and draw the head to center. Repeat this on the other side. Lastly, place a block lengthwise between your shoulder blades and another under your head. Turn the palms up and allow the chest muscles to passively stretch. You can stay here for up to 5 minutes. If you don’t have blocks you can lie over a foam roller for the same effect. Double Strap Pose A –You will need two yoga straps. Take one and make a loop by feeding the strap though the metal rings and back over a ring and under the second ring. Pull the strap tight to make sure you created the loop right. Lying on your back hold up the loop and put your right leg through. Place the end with the rings in your hip crease so that you can easily adjust it, while the other end of the strap is looped around your left foot. Bring your right leg up to the ceiling and place the second strap over the sole of the foot. The arms are straight and the shoulders are pressing down into the floor. After you have stretched the right hamstrings for a minute or so, bend the left knee and then tighten the strap loop around your right hip. Straighten your left leg and feel the strap pulling the femur bone down towards the left foot. Breathe here for as long as it feels appropriate for you. I usually like about 2 minutes. Double Strap Pose B – For the next version of this pose place both ends of the upper strap into your right hand. Externally rotate your right leg (turning your right foot out to the right by moving the leg from the hip joint), and breathe deeply as you begin to lower the leg out to the side. The deeper you breathe the more the diaphragm will work with the core and spinal muscles to keep you stable. Continue to press through your left heel for stability as well. The idea is to keep the pelvis and left hip rooted to the floor, versus dropping the right leg to the floor. As soon as you feel the left hip lifting off the floor stop there and instead try and stabilize the pelvis while drawing the right leg closer to your head. If you are having trouble stabilizing your torso, or if you feel strain in your lower back you can place a block or other prop under your right hip or ankle. Breathe here for 1-3 minutes. Double Strap Pose C – For the final version of the pose bring your right leg back up to the ceiling and then take both of the upper straps into your left hand. Begin to cross your right leg over to the left, rolling over onto your left side stacking your right hip on top of your left. You do not need to lock out the right knee. In fact if at any time during these variations you feel the leg trembling or shaking you can soften the bend in the knee and back off a bit. Sometimes as we try too hard we actually overstretch the nerve which fires and tells the muscle to contract. As it does it becomes counter productive since the muscle is contracting and shortening while you want to relax and stretch it. Remember that sometimes less is more. Once you have crossed the right leg over you can let it hover at hip height or place your foot on a block for support. Keep both shoulder blades on the floor to complete the twist. You will feel a stretch in the right buttock which is lengthening the muscle that covers the sciatic nerve. This should help alleviate the pressure on the nerve and when done right I find this whole sequence will help to relieve sciatic symptoms. After 1-3 minutes you can come out of the pose and take off the second strap. Lie on your back a moment with your eyes closed and notice the extra length and space in your right hip and low back. Return the loop to it’s original loop size and repeat the sequence on the left side. Surya Namaskar A is a sun salutation. This salute to the sun is the first in the series of Salutations. Traditionally a sun salute is done in the morning to greet the new day. This can be considered a full practice since it contains all the necessary elements; breath, forward folds, backbends and core. Begin by practicing each step, spending a few breaths in each pose. When you feel comfortable with the sequence you can eventually move at a pace that is one movement per breath. Inhale for backbends and exhale for forward bends. When you feel your ready, try doing 5 cycles of Surya Namaskar A. I have shown stepping back to plank. If you choose to jump back, land in Chaturanga with the elbows bent. This is safer for the joints as it’s less jarring to the body. I have not included the best photo of Chaturanga so be mindful that the elbows are over the wrists, like in Cobra pose. For the end I have shown hopping forward, you could also walk the feet up to the front of the mat. Have fun with your mini practice getting a great start to your day! Plantar Fasciitis is the inflammation of the tissue on the sole of the foot. The Plantar Fascia is a thick connective tissue that extends from the heel to the toes and creates the arch of the foot. When walking this tissue is under tension and helps create a spring action to conserve energy and propel the body forward. When the tissue becomes inflamed it may be more difficult to Dorsiflex the ankle, which is to draw the toes toward the shin bone. Pain may be felt in the heel or in the arch when taking the first steps of the day. Making sure your ankle, Achilles tendon, and calf muscles are flexible can help prevent plantar fasciitis so here are a few poses you can use. To decompress the front of the ankles you can sit on your feet. Start by bringing your feet underneath your sit bones while keeping the heels together. If this is relatively comfortable you can sit here for a couple of minutes. For those who are a bit more flexible you can place your hands on the floor behind you and lean back allowing the knees to lift off the floor, stretching the front of the ankles. Slowly lower the knees back down. If you ever feel discomfort in the knees then either place a blanket in the knee crease to keep the joint open or you can elevate the hips by sitting on a block or other prop. The higher the hips, the less pressure on the knees and ankles. If there is still discomfort in the knees then come out of the pose. Next, curl all ten toes under on the mat and bring the heels together. See if you can sit on the heels. This will stretch the toes and the plantar fascia. If it is a new stretch for you, you may only be here for a breath or two. Eventually it will feel more comfortable and you can stay here for several minutes. Lastly, come to table pose on hands and knees and lift the hips up to the ceiling in good old fashioned Downward facing dog pose. Hands are shoulder width apart and feet are hip width apart. “Walk the dog”, by bending the right knee and press the left heel to the floor with a straight leg. Then bend the left knee and press the right heel to the floor with a straight leg. Continue to walk it out side to side to stretch the calves and Achilles. Straighten both legs and come up onto the tiptoes and then slowly lower the heel towards the floor. When your done with this sequence come down into child’s pose to rest and feel the effects of your practice.